George Calombaris has had nothing but praise and accolades since opening The Press Club in 2006. The menu is modern Greek, taking traditional ingredients and flavours of his home country but serving them in an updated style that is unique, even in this most Hellenic of cities. Where innovation is the key word in the kitchen, flexibility takes charge on the menu and in the overall setup. The venue includes a restaurant, private function room and bar. In the restaurant, diners have the choice of a la carte, kerasma - a Greek style of sharing menu - or degustation. Before being faced with that range of options, however, there is also the choice to turn right rather than left after stepping into the foyer of the former Herald building, and instead select the smaller, cheaper Bar. 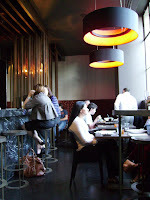 The bar menu is as user-friendly as the restaurant's is expansive. The 20 or so dishes are grouped as one of three types of mezedes (which are suggested as accompaniments to wine, beer or ouzo) larger dishes or glyka (desserts). A refined list of wines by the glass is included on the bar menu, although behind the counter an enormous range of beers, spirits, ouzo and wines (including several Greek varieties) awaits. We drank a crisp, appley Chapel Hill 'Il Vescovo' Pinot Grigio at $9 a glass. Of the 11 larger dishes on offer, I think all three of us could happily have ordered any one. Tempting as it was to sample Calombaris' take on some Greek favourites, neither the open souvlaki of the day, nor the calamari got an invite to our table. We were determined, however, that the Greek 'Parma' should get a run. 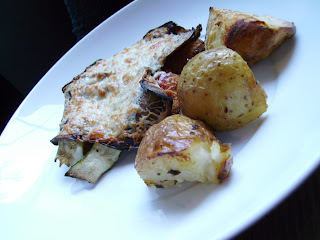 Tender thigh meat, in lightly-seasoned crumb, was topped with zucchini and eggplant. Kefalograviera cheese is melted on top, giving the dish a robust saltiness, which allowed the schnitzel to be more delicately flavoured than in a more pub-style parma. It comes with fresh lemon potato. 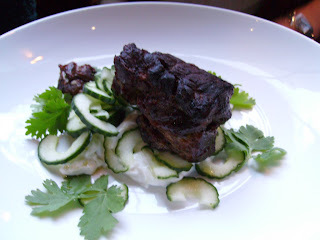 A salad of cucumber and braised lamb perches on a bed of (lightly) minted yoghurt. The lamb neck was charred on the outside but pink and moist inside. It is perhaps one of the more traditionally Greek dishes on the menu: the triumverate of Greek flavours enhanced simply through freshness, rather than added flair. 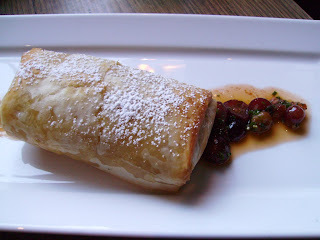 The dark horse of the night was the pumpkin and almond bougatsa, with Byzantine grape dressing. Bougatsa is normally a sweet dish of custard served in filo pastry. Here, the custard was replaced with mashed pumpkin in a bechamel sauce, dotted with slivers of almond and a smattering of fennel. A sprinkling of icing sugar nodded to the dish's more traditional incarnation. The bar menu is an excellent way to introduce yourself to the fine dining of The Press Club, whether you're yet to sample the main restaurant because you're short on money, or time (it's currently booked out 2 weeks in advance, up to a month on weekends). It is a bar, however: a little crowded, with lots of suits sampling the multinational drinks menu and a plasma TV in one corner. Some exact calculations have been done to match the accessible dish prices with their size: they are not stingy, but the focus is very much on quality rather than quantity, which I think is a reasonable decision when it allows you to sample The Age's Chef of the Year for as little as $15 a dish.